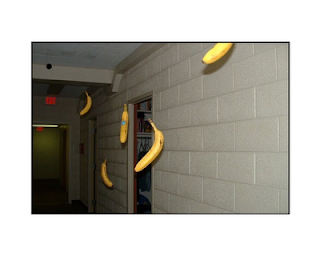 Harrowing accounts of deadly flying banana attacks have been reported at Illogicopedia's Rio Di Janerio offices. A fellow named Roberto has escaped the the mayhem to report exclusively to us as IllogiNews on the situation, such as it is. According to Roger, Roberto says robot bananas are the first strike shock troops that insinuate themselves into your nostrils. Sub-atomically, migraine structures become insinuated on the vascular bundles right next to your mom. Other gambits have been proposed by Darth Vader, Chiquita, Thessaly Boogers and Froogles MacKenzie. Robot bananas? I can think of nothing worse than the things eating away at your insides. Yeck. Yeah, but they're capitalist robot bananas, so it's OK.